Thank Goodness for Donna Hay. More specifically, thank goodness for my favorite blog event, Hay Hay It’s Donna Day. Started by Barbara at Winos and Foodies, it’s something that I *really* try not to miss…even in the most hectic of circumstances – I even wrote the round up for one from the lobby of the hospital when my mom was ill! Life has been a wild ride the past month or so…and work has been a very busy distraction for me. I’ve welcomed the hectic pace. However, that means I haven’t stopped to really cook anything for myself in a good while. When Bron Marshall, the most recent winner of HHDD, announced her theme, I sort of cocked my head to the side and went…"Huh?" I had seen clafoutis in my Donna Hay cookbooks but had never attempted one. As usual, these blog events provide a great incentive to give new things a go. It turns out that this is one of my favorite things I’ve ever made for this blog. The problem was, however, my lack of dessert appreciation – especially when cooking for one. Like fruity desserts well enough…but I didn’t want to make a sweet version and have it be sitting around my house…just waiting for me to pick at it until it was gone. Add to that the fact that I’m trying to watch my carbs due to a pending beach getaway and my new-ish single status (yes i said it). My friend Mike emailed me over a bunch of clafoutis recipes, a staple in his house. This version immediately caught my attention – tomatoes and basil are two of my favorite things, in case you hadn’t noticed. The batter part called for very little flour, which wouldn’t blow the carb farm. This was so delicious and easy to make – make your batter, throw the tomatoes in whole, and bake it. I threw on a handful of arugula for a pop of color and some bitterness with the creamy clafoutis. I also substituted Greek yogurt for regular yogurt or sour cream – the tang was noticeable and added a nice touch. – Preheat oven to 375 degrees. Lightly grease a 9 inch pie plate with butter. Beat the eggs in a large bowl, then beat in the flour. Add the yogurt and milk, beating until smooth. Stir in the basil and all but 2 tablespoons of the Parmesan cheese. – Spread the tomatoes, evenly over the bottom of the pie plate. Pour the batter over the tomatoes and sprinkle with the remaining cheese. Season with salt and pepper. – Bake for 30-35 minutes, until top is golden brown, and tomato juices are bubbling. Remove from the oven and allow to cool for 10 minutes before serving. Yay!!! I *knew* you would make us a delicious savoury version! Looks and sounds sensational – thanks so much! Oh interesting! I’ve only ever seen dessert clafoutis, which are good, but this looks so very appealing. And easy! Thanks Tami, I’m glad we keep in touch, I’ll add your changed recipe to my list of Clafoutis recipes and know that your version is a winner. I’m always glad to help when I can. Fantastic. I have made sweet ones, may times; but, never attempted to do it savory! What a wonderful idea! Fabulous Tami. I could do with watching my carbs so will have to try this one. This looks wonderful. Enjoy the singleness and have a blast! Brilliant recipe, it sounds fabulous. Knock ’em dead at the beach! 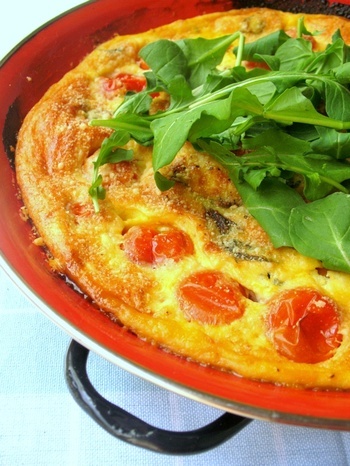 Loving’ the Savory Clafoutis – very yummy! Oh – talked about ya – were your ears burning? I hadn’t even considered a savoury version, it looks great! I am a new fan of Clafoutis, and most defineatly have to try a savory version. Looks fantastic! Awesome and I’m sure delicious clafoutis! This looks great. I’ve only tried sweet ones so far, but this looks great!